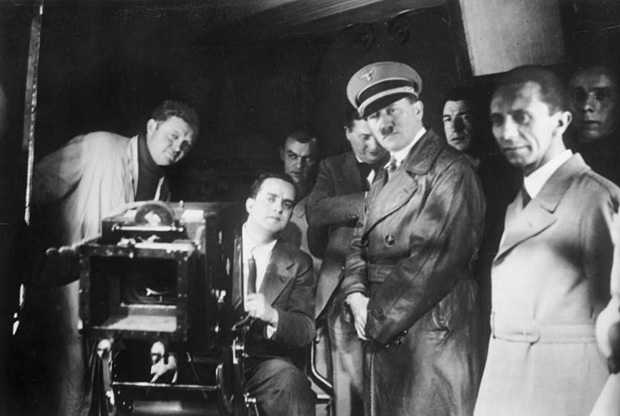 The May 10, 2013 issue of Tablet magazine featured a review of a forthcoming book published by Harvard University Press, The Collaboration: Hollywood’s Pact With Hitler, that is said to reveal a “creepy love affair” with Hitler. See http://tinyurl.com/lnbengk. I had a negative response to this article nailing Hollywood executives such as Carl Laemmle Sr., Jack Warner, and (by implication) MGM’s Louis B. Mayer. For many decades, I have studied the U.S. appropriation of Nazi methods in controlling the” little people” that prominent German refugees held responsible for the rise of Hitler. Indeed, the Frankfurt School critical theorists, elitists that they were, blamed mass media for Hitler’s appeal. I have detailed analysis of the populist and progressive support for Nazi methods of mind control on my website, and have shared them here. But what I find particularly ironic is that David Mikics, the author of the Tablet piece is a postmodernist exponent of Jacques Derrida (the hero whose dubious alliances have been questioned by other postmodernists), while the author of the forthcoming book Ben Urwand, is a Harvard Junior Fellow. How ironic? Harvard was the site of many ardent proposals that Nazi and German methods of managing the masses be taken up by progressives and populists in America. See for example this series of essays posted on my website: https://clarespark.com/2011/03/27/progressive-mind-managers-ca-1941-42/, https://clarespark.com/2009/12/13/klara-hitlers-son-and-jewish-blood/, and https://clarespark.com/2010/04/18/links-to-nazi-sykewar-american-style/. One of the principal disseminators of protofascist social psychological methods, Henry A. Murray, former director of the Harvard Clinic, has sealed papers at Harvard University Archives, controlled by his widow Caroline Fish Murray (I tried to get into them in 1995 and was rebuffed unless I provided Mrs. Murray with an outline of the book I planned to write!) Murray’s role in these propaganda offensives has been effectively covered up by the professoriate. Other figures associated with Murray, such as Gordon Allport and Walter Langer, have been similarly protected from academic scrutiny.